Queen Elizabeth's Diamond Jubilee has a little something for everyone, including design geeks. 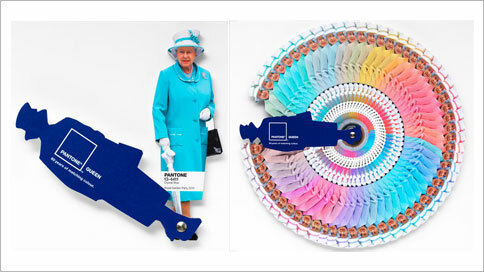 Leo Burnett in London and Pantone worked together to create this nice little Pantone wheel based on the 60 years of the British monarch's notorious color-matched outfits. Each outfit lists a Pantone number and the date she wore the clothing. "When you see footage, or read commentary, of Queen Elizabeth on her official engagements, at a Royal Wedding or even watching her horse race at the Derby, there is always mention of what she's wearing," says Burnett executive creative director Justin Tindall. "It has been an ever-present subtext to the 60-year reign of our monarch. The Diamond Jubilee Color Guide is a celebration of that reign through color and its meaning." Adds Leatrice Eiseman, executive director of the Pantone Color Institute: "The Queen's decision to favor one color in every outfit is a strong style statement. Monochromatic color schemes make the wearer appear taller, delivering a more stately air—perfect given that Queen Elizabeth is not tall at 5-foot-4. Choosing one color theme also ensures the outfit does not detract attention from the wearer—which is particularly important if you're the Queen." Via Ads of the World.